Emotions were at the heart of celebration in Kaliningrad, Russia during the World Cup group E match between Switzerland and Serbia on Friday night, as nationalist symbol of Albania, two-headed eagles flapped from the ground attacking the Serbian sentiments. Switzerland boarding four players with Albanian ethnic heritage, three of them from Kosovo, evoked emotions and political gestures to the ground. The unquenched thirst throughout the first half with an early goal deficit made the Swiss, especially the Albanians impatient and in the commencement of second half, minutes later what Xhaka struck was a 25 yard curving bullet shot to the hearts of Serbians. And the 90′ goal of Shaqiri devastated Serbian dreams, Switzerland landing smooth onto second place in the group along with Brazil, who beat Costa Rica earlier in the day. 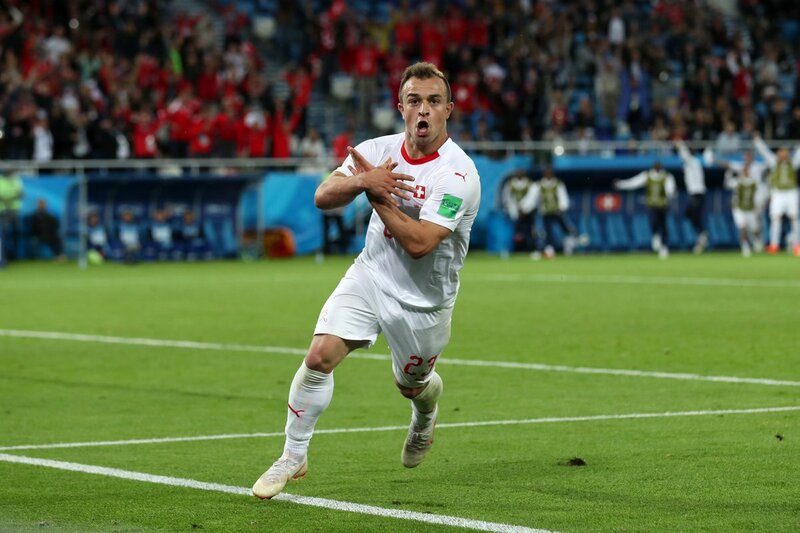 The Swiss scorers, with Albanian ethnicity, Granit Xhaka and Xherdan Shaqiri, rejoiced their 2-1 win over the Serbs with thumbs locked and fingers outstretched, fluttering the double-headed eagle of the Albanian flag, where thumbs resembled the head and the fingers as that of wings. This goal celebration turned into an overnight controversy which prompted a FIFA investigation that may lead to at least two games ban for the duo. “For me it was a really special day, this is a victory for my family, for Switzerland, Albania, and Kosovo. The gesture was for everyone who has supported me, it was not aimed at our opponents. It was a really emotional game.” Said Xhaka. Politics that was being dragged on to the ground provoked tensions between Serbian nationalists and ethnic Albanians and the Serbian authorities have called on FIFA to take disciplinary proceedings. Xhaka’s childhood was filled with the tales of toils that his father underwent in prison in Yugoslavia in 1986 for demanding for their basic domestic rights by protesting against the Serbians, and the tinge of tears that his mother shed three and a half long years yearning for her long lost husband, the Arsenal midfielder’s heart was scarred and the scars wounded with animosity on every view of Serbian flag. Granit Xhaka, whose parents originally belonged to Kosovo, the disputed borderland between Serbia and Albania, were forced to migrate to Switzerland in 1990s to escape the war, where Xhaka and his elder brother Taulant Xhaka, who plays for Albanian national team, were born and brought up. The stringency that their borderland suffered throughout the time stayed heavy in each of Albanian hearts. Kosovo, declared itself as an independent state after 10 long years of hardships in the year 2008, but was not allowed autonomy from the Serbs and the dispute continued. Xherdan Shaqiri, like Xhaka fled to the shelter of Switzerland in the age of four. And with flickers of memories his National sentiments stayed intact even while he played each match for Switzerland. And this was seen even on the heels of the Stoke City star, on right foot he had the Kosovar flag and the left, Switzerland flag in the match against Serbia. Even when criticisms finds its way through Russian eyes, Swiss media, or in Serbian sighs, the emotions that flooded from these players during the match was something unstoppable. The torture and torment that each of the Kosovar family had to go through and the unending rolls of ruins that their families enumerated, sprouted in them the ache of playing the game. And this match meant much more than a match…! And Switzerland, that homed hundreds of thousands of their Kosovar neighbors, who crossed their national boundaries due to war, were etched in their hearts. And their win meant much more than a win…! And years later after the war ended with the intervention of NATO, in 2008 did Kosovo have the audacity to declare Independence that Belgrade still keeps refusing to recognize this declaration. And Russia is their traditional ally and supports this. So, when the whistle blows in Kaliningrad where Serbia stands against Switzerland, the Russian crowd cheers Serbia. Thus, the match itself is politically stimulated. And their goals meant much more than goals…! On their next match on Wednesday, Switzerland face Costa Rica in Nizhny Novgorod while at the same time Serbia will take on Brazil in St.Petersburg.